Project leader Ari Väisänen, Dr. Siiri Perämäki and M.Sc. Joona Rajahalme are part of the research team that has developed methods for the valorization of various waste materials. 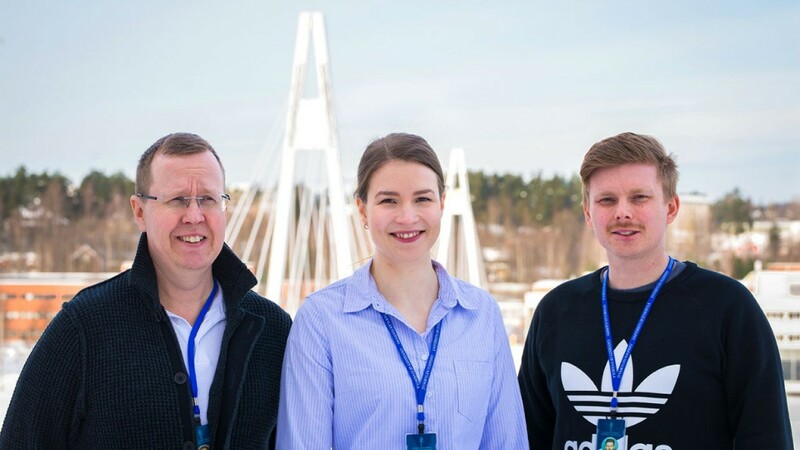 A research group from the Department of Chemistry at the University of Jyväskylä, Finland, has focused on the circular economy and developed innovative process technologies applicable for various industrial uses. Adjunct Professor Ari Väisänen and his Metal Analysis and Recovery Research Group have found new methods to analyze and separate harmful and critical metals from environmental samples and electronic equipment in order to promote the circular economy. The European Union has become increasingly dependent on the import of critical raw materials (CRMs) used by industry, making the EU more vulnerable to changes in the market economy. The demand for CRMs, especially platinum group metals (PGMs), rare earth metals (REMs), silver and gallium in strategic energy technologies sector alone is estimated to grow very rapidly until 2030. At the same time, the level of recycling of all the mentioned CRMs is lower than 11% in comparison to their usage. As the demand for CRMs grows, it poses risks to the development of market prices and availability. The use of waste materials is a new resource for CRMs and poses an opportunity to recycle waste materials and provide self-sufficiency for the European Union. Researchers from the Department of Chemistry at the University of Jyväskylä have developed a modular approach for the recycling of heterogeneous waste electrical and electronic equipment (WEEE). The recovery process is based on hydrometallurgy, coupled with the electrowinning of copper and modern metal scavenger technologies. Thermally treated WEEE is leached in stages to separate the metals into the leachates. Copper is recovered via classic electrowinning and noble metals using a novel liquid-liquid extraction and state-of-the-art metal scavengers. "We are producing gold, silver, palladium, copper and platinum with very high recovery rates and purities, and rare earth metals as oxides," says project leader Ari Väisänen from the Department of Chemistry at the University of Jyväskylä. "The laboratory-scale research started three years ago in collaboration with the Technology Industries of Finland in order to produce an industrial-scale recovery process. In the latest project funded by Sitra, the Finnish Innovation Fund, the process is being optimized further." The developed process has been validated in the laboratory and now, in collaboration with engineering experts, the process is being upscaled to an R&D demonstration facility. The companies participating in the project are the Jyväskylä Energy Group, Tapojärvi Oy, and Elker Oy. The primary goal of the R&D demonstration facility is to ensure the scalability of the developed modular process into an industrial-scale process and to produce a fully functional metal recovery unit for commercialization. "One of our goals is to develop each metal recovery module further and to produce new innovative and energy-efficient processes," says Dr. Siiri Perämäki from the Department of Chemistry. One of the research projects, "Innovative Circular Economy: Raw materials from own province", provides new fundamental knowledge and selective extraction techniques to recover critical metals (PGMs, REMs, gold, rubidium and phosphorus in particular) from waste streams such as power plant fly ash, wastewater, and sewage sludge. Effective and selective capturing of CRMs using granulated or 3D-printed scavenger objects enables recovery processes for waste streams that contain only low CRM concentrations. "Instead of the extraction of minerals, this innovative way of thinking enables the recovery of critical metals from waste materials for the manufacturers of high-technology devices," says Perämäki. The increasing concern over the availability of phosphorus will lead to recovery from various alternative resources. Biomass fly ash and wastewater are both significant resources of phosphorus with a high potential for recovery. Due to this research, the high-tech metals and phosphorus can be recovered from a region's own waste streams, which has a positive effect on the employment situation, and increases important know-how and overall wellbeing of the region. One of the key aspects in this project is the capability to analyze critical metals at very low concentration levels, especially from wastewater. This goal can only be achieved using the ICP-MS technique. In this project, a new ICP-MS instrument was also validated for the analysis of critical metals as well as silver and titanium dioxide nanoparticles at very low concentration levels. The new technology of the ICP-MS instrument enables measurement fast enough to identify individual nanoparticles. The fate of nanoparticles, especially silver nanoparticles, has raised concerns due to their increased use. In this project, the nanoparticle concentrations were determined in treated wastewater samples collected at a local wastewater treatment plant. The method development performed in this study can give rise to entirely new possibilities for utilizing waste materials. "Furthermore," says Ari Väisänen, "this could lead to a new kind of commercial activity, which combines recycling know-how, environmental expertise, process technology, metal processing and even intelligent material development. When the above-mentioned issues are combined, we are moving towards upgrading economy. With further utilization of the developed processes, it would be possible to achieve carbon-neutral solutions, environmental self-sufficiency and closed loops, wherein natural resources are used efficiently for energy and products."